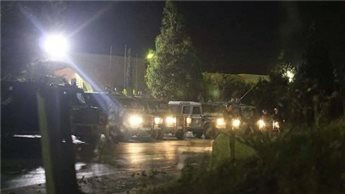 So it was also AL Quds University’s turn in the night raids. No one is spared under occupation. No need to condemn or complain, it was just another material damage, our youth were not involved. To those who don’t know, these are night raids. They enter like thieves while everyone is sleeping. I don’t know if I am under the effect of the reading about Islamic conquests and the Mogul raids and the Crusades subjugations. The scenario of last week is exactly a reflection of how occupation apparatus operates. When they say that occupation doesn’t save a tree or a life it seems so right … in front of our own eyes. I always pictured in my head what happened in 1948, when half of the Palestinian population was condemned into refugee-hood after stories that by the decades seemed like myth, of how the Israeli terrorist organizations used to raid into villages and terrorize the people by killing them and torturing them. The Photos and the videos that have been sent around in the last week, awakened those pictures I was designing in my head for years, almost thinking they could have been mythical. The shame that the 1948 brought to us as a nation was always left untold in many of those who lived it. I always thought it was … but watching children dragged in front of their parents, or neighbors, or any adult passer by and not being able to help, or to stop the subjugation that is falling upon a child in front of your own eyes, bring defeat as an injection in the veins. This link between the alleged kidnapping. Since I am not sure of it anymore, I will call it missing settlers affair and targeting Hamas or Islamic organizations and people. Hamas never admitted that it was its organization. They wouldn’t hesitate if it was they. At the end when you kidnap someone you announce your demands. First we were told they were two former prisoners from Hebron, and then we saw them going to search for another Hamas suspect in Ramallah. The fact that the first two suspects were missing (the Hamas guys) could be easy. OUR PA security subjects can do this. At the end it falls under coordination sub- categories. Each passing day of this cynical drama proves a full coordination of a previously set up plan between Israel and Abu Mazen . It cannot all be a coincidence after the strange quick formation of the new “toy” , “temporarily” , “unity” government. It couldn’t be that Abu Mazen sits in the Muqata mosque listening to that rat who calls himself A man of religion while he attacks Hamas figures by name , just a week after the formation of the government , and then Israel finds the gates of the west bank opened with precise addresses to every single Islamic organization that could be affiliated with Hamas including university campuses . All this is too far from being Israel’s own master plan..